If you have any questions about the CANICA information page below please contact us. The sailing yacht CANICA is a 43 metre 141 (foot) generous composite vessel which was crafted by Baltic Yachts and her design is by Judel-Vrolijk and R & J Design. Sleeping 10 passengers and 5 crew members, sailing yacht CANICA was formerly named 140-01. The balanced boat has been created by a naval architect called Judel-Vrolijk and R & J Design. John Munford was successful with her interior design brief. CANICA is a custom built 140ft Sloop built by Baltic Yachts in Finland. The philosophy for the design was to create a luxury Sailing Yacht capable of outstanding performance with style and modern technology. The superior performance and handling of CANICA has been created largely by her low displacement which was targeted by the designers to be around half of that of a normal yacht of her size. They have achieved this by using high technology and the best materials available. The owners, naval architect Judel/Vrolijk & Co and the interior designer John Munford who worked with the Baltic Yachts in-house design team, R&J Design have made this build truly outstanding. Judel-Vrolijk was the naval architecture company involved in the formal superyacht design work for CANICA. Her interior design was completed by John Munford. Judel-Vrolijk and R & J Design is also associated with the yacht wider design collaboration for this boat. Created at Baltic Yachts this vessel was fabricated in Finland. She was successfully launched in Bosund in 2003 before being transferred to the owner. A spacious feeling is achieved with a total beam (width) of 8.34 m / 27.4 feet. With a 5.85m (19.2ft) draught (maximum depth) she is deep. The material composite was used in the building of the hull of the sailing yacht. Her superstructure over the hull is built out of composite. Powered by a sole CATERPILLAR diesel engines, CANICA is able to attain a top speed of 12 knots. CANICA is propelled by a single screw propeller. She also has an efficient range of 3000 miles when motoring at her cruise speed of 10 knots. Her total HP is 745 HP and her total Kilowatts are 745. Concerning thrusters she was fitted with Maxpower / Stern: Maxpower. 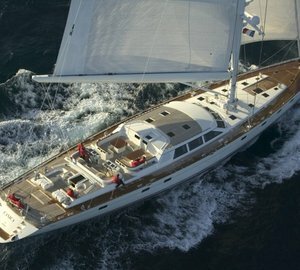 The capacious luxury yacht sailing yacht CANICA is able to accommodate as many as 10 guests and 5 qualified crew. 42.92 metres / 140.8 feet. Giving the combined power of 745 HP /745 KW. Northern Lights 1 times 55 kilowatts, 1 times 33 kilowatts. During Sept 2009 CANICA traveled to Palma, in Spain. This sailing yacht also cruised the location near Illes Balears during the month of Sept 2009. This sailing yacht has a teak deck. The luxury yacht CANICA displayed on this page is merely informational and she is not necessarily available for yacht charter or for sale, nor is she represented or marketed in anyway by CharterWorld. This web page and the superyacht information contained herein is not contractual. All yacht specifications and informations are displayed in good faith but CharterWorld does not warrant or assume any legal liability or responsibility for the current accuracy, completeness, validity, or usefulness of any superyacht information and/or images displayed. All boat information is subject to change without prior notice and may not be current.